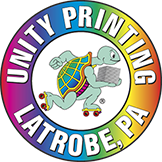 The Palace Printer has state of the art equipment to produce your newsletter in color or black and white on a variety of papers. For month after month of dependable and reliable service, let The Palace Printer, be your printer. Call The Palace Printer at 724-836-7777 now.